Guna: A pregnant woman has been sterilised at Mayana sub-health centre in Madhya Pradesh’s Guna district, health officials informed. The blunder came to light when the woman experienced stomach pain and an ultrasound revealed three months’ pregnancy. Rekhabai took the decision to stop having children in order to avail the benefit of the Ladali Laxmi Yojana and underwent tubectomy on November 29, 2016. A urine test was done prior to the sterilisation to ascertain whether the woman was not already pregnant.The woman reached the sub-health centre following severe abdominal pain and was advised ultrasound which was performed at a private centre. The report revealed that the woman was three months pregnant. Chief Medical and Health Officer Pradeep Mishra said that the negligence was evident from the fact that the woman was sterilised two months ago while she is already three months pregnant. He said that the ultrasound report would be sent to Bhopal and assured that action would be taken against the doctor concerned if found guilty. 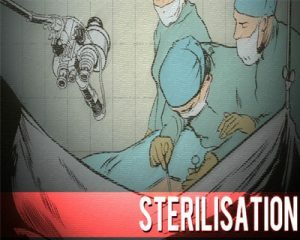 Criteria for sterilization in woman must be updated…there should be two Urine pregnancy test – one month apart -> if both are negative than only there should be sterilization.